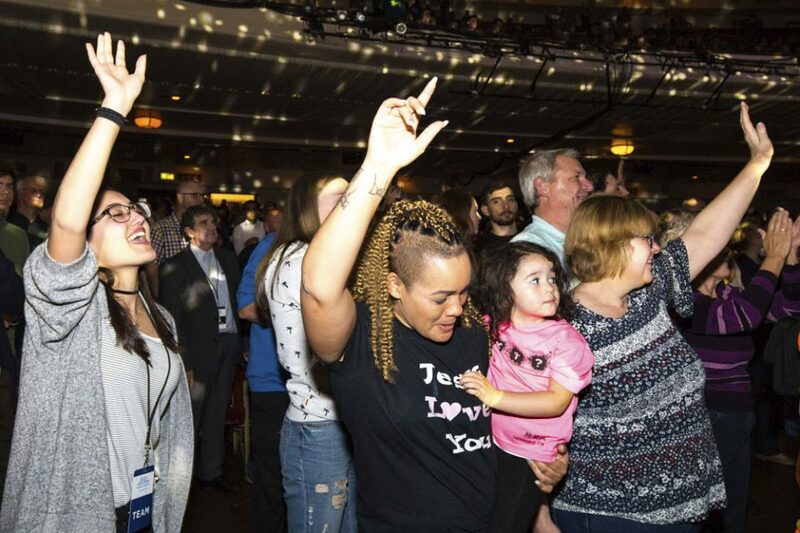 “It doesn’t matter who you are, where you’re from; God loves you,” Franklin Graham said in Blackpool, on Friday. His father preached there 36 years ago, and true to his father’s Crusades, the night ended with “Just As I Am” as people came forward in response to Christ—just as they are. 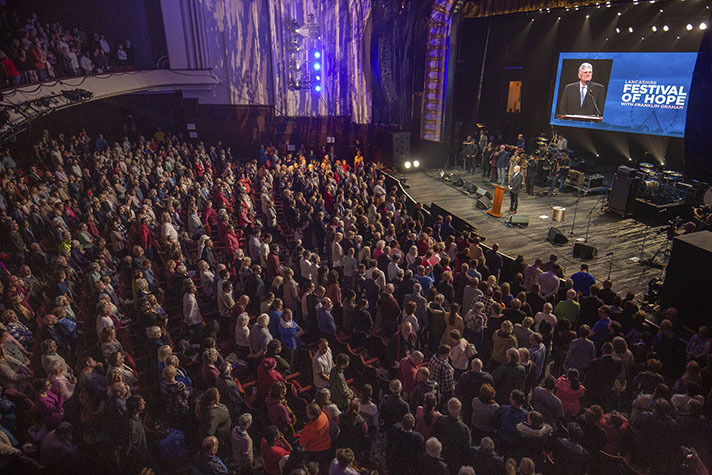 Half an hour from Winter Gardens, one of Europe’s largest entertainment complexes, dozens of voices filled a single room Friday morning with praises to Almighty God. 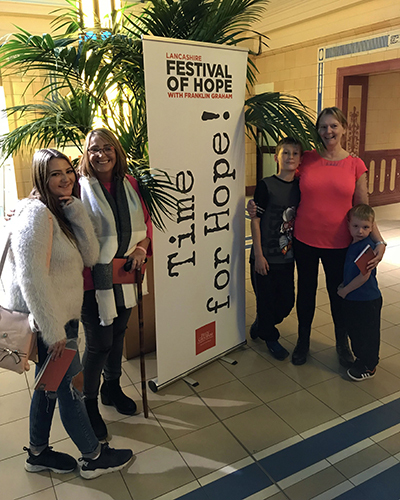 They were there to sing, pray and study God’s Word ahead of the Lancashire Festival of Hope, to be held at the Winter Gardens Opera House hours later. There were English church leaders and other locals, joined by BGEA team members from the U.K and U.S., all there for morning devotions—a tradition during Franklin Graham Festivals. As Franklin said that morning, appealing to God in prayer must precede every event as it’s only through His strength that anything significant can be accomplished. 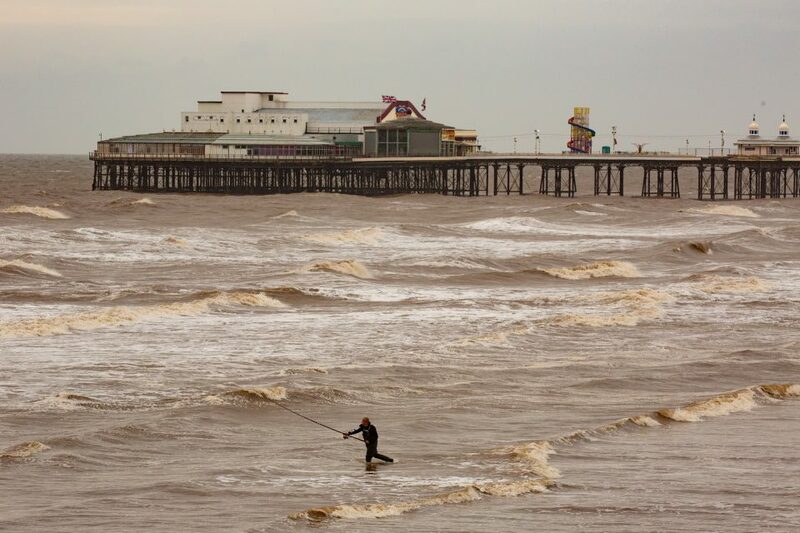 Planning for the three-day Festival in the seaside city of Blackpool started back in April 2017. The very next month, the opposition began, eventually ramping up in the past weeks and months with pulled advertisements and planned protests. On Friday evening, a group of about 40 activists protested the Festival across the street. The thing is, as Franklin Graham said earlier in the day, it’s happened before. And it’s never hindered God. “We’ve seen God at work time and time again. … We’re not here in our name; we’re here in His name,” he said. That name carries power, evident in the shoulder-to-shoulder mass of people who later filled the carpeted space in front of the stage as Franklin invited them to start anew with Christ. The Winter Gardens Opera House in Blackpool, has hosted an array of celebrities, from Bob Dylan and Frank Sinatra to Bette Midler and Judy Garland. This weekend, the venue is home to the Lancashire Festival of Hope, a three-day event with Christian artists like The Afters, Rend Collective, and Michael W. Smith, and a message of hope from Franklin Graham. Franklin Graham’s late father, Billy Graham, also preached in Blackpool in 1982. The tourist hot-spot with its ocean-view attractions and brightly lit promenade is sometimes called the Vegas of the U.K.
More than 2,000 people filled the three-tier Opera House, with nearly 8,000 from 73 countries watching online. All had the chance to hear from Franklin Graham how he went from a rebellious teen to someone unashamed to talk about Christ. That’s until he turned everything over to Jesus at age 22, changing the course of his life. The same Jesus is still changing lives, including five in particular on Friday night. Prayer volunteer Liz Batton was beaming after praying with 15-year-old Mary who came down from the balcony with a whole crew: her mother Sue, Sue’s friend Geraldine, and Geraldine’s two grandsons, ages 12 and 4. All are from Blackpool. Sue used to go to church, but got out of the habit and started going her own way in life. “I gave up my faith and going to church,” she explained. But something hasn’t been quite right since then. As Sue gave her life fully to Jesus Friday night, her daughter Mary was feet away doing the same. So was Geraldine. And her two grandsons. Like her mother, Mary drifted from God and “just stopped believing.” Then, a few weeks ago during a vacation in Egypt, she decided she wanted to be close to Him and took the first step on Friday. “I’ve never been to one of these before, and I wanted to see what it was like,” Geraldine said later. She’s been going to church for a while and, by the end of the evening, not only had a taste of the Festival she was so curious about, but also decided once and for all to put her life in the hands of Christ. Is it time to come back to God? Start here. Friday was a cold, blustery day in Blackpool, but not inside the Opera House. The Festival of Hope continues there this weekend. Will you support the ongoing mission of evangelism across the UK? Your gift helps equip the Billy Graham Evangelistic Association with the resources—including personnel, materials, support services, buildings and more — to fulfil our mission of reaching the world with the Good News of Jesus Christ. Click one of the defined amounts below or enter your own.